This Is What The Color of Your Pee Says About You! It may be strange to take a look at the business you do in the washroom, but it’s a habit that can prove to be very useful. Just like your stool can reveal a lot about your digestive system, your pee also give insight on how your kidneys are doing. Keeping track of the color and consistency of your urine helps you stay hydrated throughout the day and can be an early warning sign that something in your body just isn’t right. Here is a guide of pee color variations to look out for (1,2)! From pink to orange and green, doctors have seen it all! Drinking enough water is important to help your kidneys filter toxins. However, too much water can lead to your body expelling too much sodium, causing hyponatremia. Light yellow is the ideal color for urine and is a sure sign that you’re well hydrated. If your urine is this color, keep up your good habits. Medium yellow is normal after a long workout or first thing in the morning. However, it’s a sign that you need to drink up to avoid serious dehydration. Bubbles in urine that disappear within seconds are not usually significant. However, if the bubbles stay then it is a sign of protein leaking through the kidney filtering mechanism and ending up in your urine. 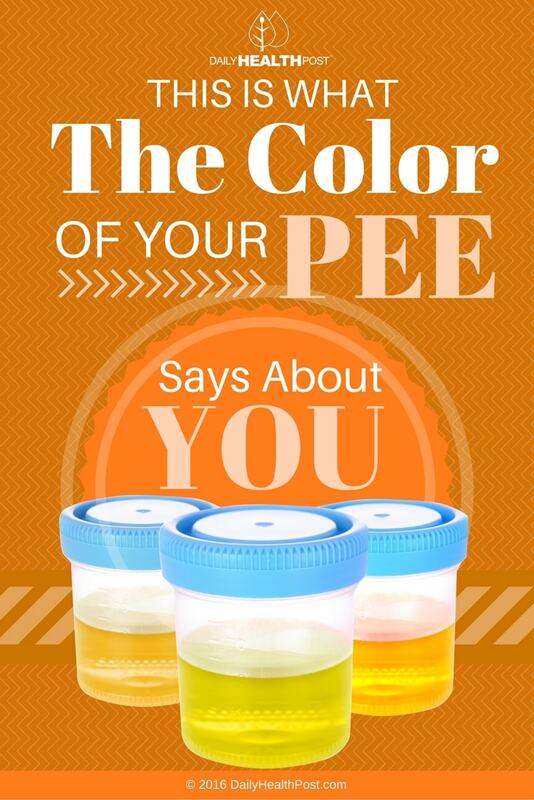 Latest Headlines » Healthy Lifestyle » This Is What The Color of Your Pee Says About You!